Tel Aviv University - Find Your LL.M. You wish to this LLM ? The Parasol Foundation International LL.M. 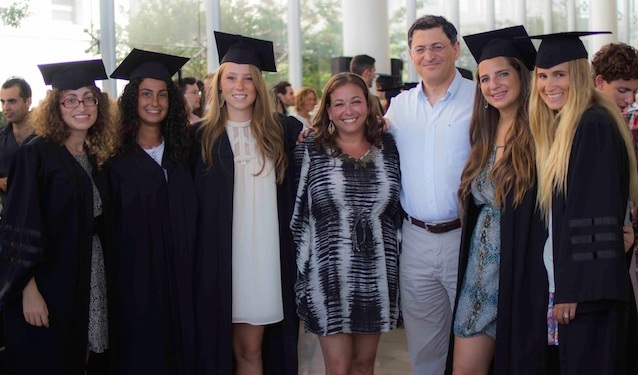 program at Tel Aviv University attracts outstanding law students to study and collaborate with Israel's elite legal academia, students and legal professionals. The rigorous academic curriculum is based on innovative approaches to legal theory, providing law students analytical tools and skills to engage in serious academic research and practical insights. More than 50 classes, taught entirely in English, explore contemporary challenges to law that stem from processes of globalization, the Israeli legal and social systems, the complexities of the Middle East region and the technological and entrepreneurial dynamism of the "Start-up Nation." The 10-month program provides numerous opportunities for networking and professional development. Tel Aviv University Buchmann Faculty of Law : a world class reputation. 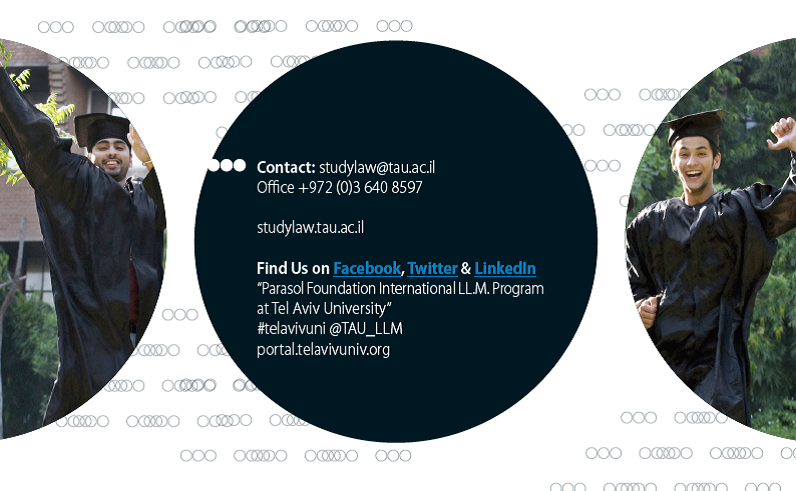 The Parasol Foundation International LL.M Program at Tel Aviv University Faculty of Law is a 10 month program which brings outstanding students from all over the world for a rigorous, highly-academic LL.M. degree. The program language of instruction is English, and although there may be a course or two on Israeli law, the focus of the LL.M. is international law. The rigorous academic curriculum is based on innovative approaches to legal theory, providing law students analytical tools and skills to engage in serious academic research and practical insights. Classes explore contemporary challenges to law that stem from the processes of globalization to specific courses on the Israeli legal and social systems, the complexities of the Middle East region and the legal aspects of the Start-up Nation. The curriculum consists of courses, seminars and workshops. The selection of courses will allow students to pursue several disciplines, including: International Law and Global Regulation Legal Theory; Law and Technology and Business Law. The program also enables the participants to choose electives from the rich variety of English-language graduate programs. The LL.M. is without thesis. LL.M. candidates will be eligible to apply for admittance to the Ph.D Program at the Faculty of Law, following the successful completion of the LL.M. degree. Financial aid / scholarships will be offered to promising candidates according to needs or academic qualifications, and in order to promote diversity. Pursue your LL.M. degree at Tel Aviv University. Applicants must have completed an undergraduate degree in law (LL.B. , JD, Bachelor of Laws) prior to starting the LL.M. degree. Students in their final year of undergraduate law degree studies may apply, and will be accepted on the condition they finish their first degree in good standing (above 80/100). Transcripts must show all courses and grades obtained, and should be submitted with the corresponding diploma. Transcripts may have to be officially translated at the applicant's expense to be reviewed by the Registrar's Office. If available, please ask your law school to provide a letter indicating your individual law school ranking. Make sure to complete the program-related questions on the application portal. Your personal statement should be no more than 500 words and should describe your background, your academic or professional interests and goals, and your motivation to study in the International LL.M. program. Letters should be written by law professors or legal employment supervisors – or a combination of both. An English-language proficiency exam must be taken before July 1, and official scores should be sent directly to the TAU International office by the testing agency. TAU International's ETS code is 7704. The minimum scores on the TOEFL test are written 582, computer-based 223, or internet-based 89. The minimum overall bandwidth score on the IELTS test is 7. Exemption may be granted – please inquire with the Admissions Director. Welcome to the Buchmann Faculty of Law website - a "virtual front door" to our law school. If you have made it this far, I strongly encourage you to take the next step and learn about our school and its programs. TAU Law is the oldest law school in Israel, tracing its roots to the Tel Aviv School of Law and Economics established in 1935. 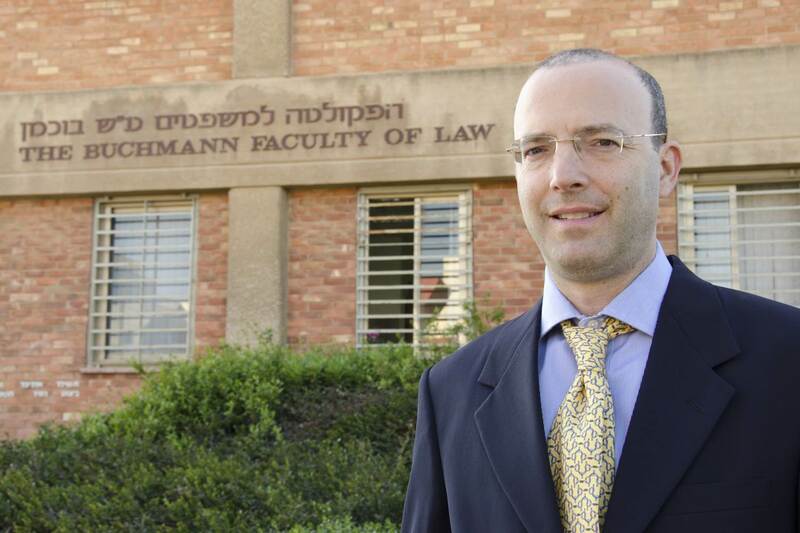 Our law school is not only the oldest but also the best law school in Israel and is a leading law school globally. Our top tier research output has been ranked by the QS 2013 annual rankings #1 outside the US and UK for scientific research impact and citations - a key indicator of the high quality of our Faculty. The law school is home to a vibrant, innovative and dedicated academic community. We, at TAU Law, seek to educate Israel's future legal leaders and strengthen its society through socially-engaged, legally-skilled and policy oriented students. Our goal is to create for our students a unique learning environment that encourages independent thinking and prepares them for their professional pursuits. It is not surprising, therefore, that many of our alumni hold senior positions in the country's leading law firms, judiciary, politics, journalism and business. In recent years, we have also attracted a growing number of promising international students and researchers. TAU Law and its faculty members are deeply involved in the legal challenges Israel faces with respect to the Israeli-Palestinian conflict, the position of religion in the Jewish State, issues of national security, welfare, immigration, health, education and more. As such, we offer a wide array of courses and seminars in fields such as Constitutional Law, Human Rights, Jewish Law, Islamic Law, International Law, Corporation Law and Intellectual Property Law. In addition, our cutting-edge Clinical Legal Education Program exposes students to real life clients and problems, to various value laden policy issues and to the exciting world of Israeli NGOs. As a country, we are positioned both culturally and economically at the junction of North America, Europe and Asia. Israel is a mixed legal system having historical layers transplanted from French, British, German and American law. This has created a unique intermix of legal thoughts and methods in the law school, which are brought into our classrooms. When it comes to legal theory and doctrine, we have won a reputation as an intellectual powerhouse. Our distinguished faculty members have been educated at leading law schools in the world, they regularly publish articles in top-ranking law reviews and interdisciplinary peer-reviewed journals, as well as books in the world's most prestigious university presses. We currently have 10 research centers and institutes. Among these is the Cegla Center for Interdisciplinary Research of the Law, which is home to our flagship journal - Theoretical Inquiries in Law (TIL), the top-ranking law review outside the US (according to the Washington and Lee ranking), and yet another indication of our high quality of research. Throughout the year we host many academic events such as workshops, colloquia, conferences and guest lectures, which are held both in Hebrew and English. We boast a long tradition of institutional and personal collaborations with leading academic institutes and scholars from across the globe. Some 25 Visiting Professors are invited to teach at the law school every year and approximately 200 short-term visitors come to take part in various academic activities. The Faculty of Law is part of a comprehensive university, comprising 9 faculties and nearly 40 schools, that all play a key role in Israel’s startup nation, being strongly involved in Israel's innovative high-tech, cyber, and biomedical energy and defense sectors. This makes our law school perfectly positioned to be a real interdisciplinary school. We have strong interdisciplinary groups in fields such as legal history, law and economics and political and moral philosophy. We often collaborate with departments in the Social Sciences and the Humanities, in both research and teaching. The school's connections and close proximity with many law firms, NGOs and high tech startup centers, enable us to give our students a broader and enriching experience. As such, we are able to bring a wide range of adjuncts to teach specialized courses, which further strengthen our ties with the legal community, and often create interesting internships and job opportunities for our graduates. For our international students we offer over 45 courses in English to choose from, as well as numerous community outreach opportunities. Our English courses are taught by internationally-renowned faculty, both from TAU Law and from leading law institutes around the world. In that respect, we go to great lengths to ensure our international students feel a sense of belonging, both during classes and after-school hours. If you are studying for an LL.B. or J.D. degree, I recommend you take a look at our vast Student Exchange Program, which includes a network of over 40 partner universities as well as “Study Abroad” opportunities for students from institutions outside the network. If you intend to study for a Masters of Laws, our year-long International LL.M. offers a number of customized study programs. For doctoral or post-doctoral students we offer various short to long-term graduate-level and post-doc level study and research opportunities, as part of the unique Zvi Meitar Center for Advanced Legal Studies, as well as the Safra Center for Ethics and the Globaltrust Project. Young faculty members are also invited to come visit us as visiting researchers. As a visiting scholar, you will have access to the David J. Light Law Library, as well as the full range of our academic events. All of our international students benefit from personal travel related and academic counselling, orientation, tours and social events. Let me close by stating that, as Dean, I am committed to maintaining our position at the forefront of legal education in Israel. I invite you, once again, to explore our website, and in particular, our faculty members' webpages, research centers and calendar of events. I am confident that you will find a remarkable amount of study programs and opportunities that might suite you. Greater Tel Aviv-Yafo is a world-class academic hub and a popular destination for international students. Four universities and a dozen colleges offer a wide range of programs - from short semesters to full degrees, all taught in English. Together with top academic programs, Tel-Aviv-Yafo offers young people a dynamic student life. Lonely Planet ranked Tel-Aviv-Yafo as number 3 in the hottest destinations for 2011, thanks to its bustling nightlife, lively art scene, and 14-kilometer beach. One out of three residents in the city is between the ages of 18 and 35, making it a perfect location to study for your LL.M.! Through a wide range of classes taught by world-renowned professors, international students have the opportunity to study for their advanced academic law degree at Israel’s leading law faculty. The rigorous academic curriculum is based on innovative approaches to legal theory that will provide law students with insights for legal practice and analytic skills for advanced academic research. Nearly 50 classes, taught entirely in English, explore contemporary challenges to the law stemming from processes of globalization, the Israeli legal and social systems, the complexities of the Middle East region, and the technological and entrepreneurial dynamism of the “Start-up Nation”. LL.M. candidates will be eligible to apply for conditional admittance to the PhD Program at the Faculty of Law, following the successful completion of the LL.M. degree. Substantial fellowships will be offered to promising candidates according to needs and academic qualifications, and in order to promote diversity. Tel Aviv is a global city, rich in diversity and culture. Within its bustling metropolis is Tel Aviv University, home to over 1,000 international students in diverse programs. With 14 kilometers of white sandy beach and 300 days of sunshine a year, Tel Aviv's friendly and liberal vibe is unbeatable. The city offers a rare blend of world-class culture and global innovation, and boasts one of the world's leading nightlife scenes. Home to hundreds of theatres, music venues and galleries, the world's largest grouping of Bauhaus architecture, and some of the world's best parties, it's no wonder the New York Times declared Tel Aviv the 'Capital of Mediterranean Cool'. Tel Aviv's young energy is contagious and between the bars, cafés, restaurants, and street parties, the city runs on full energy 24/7. Surfers, trendy boutiques, sizzling beaches, gourmet cuisine, parks and green spaces – the city thrives on the unexpected, the diverse and the spontaneous. Tel Aviv is home to Israel's oldest School for Performing Arts as well as the National Theater of Israel. However the city is also full of smaller theater companies that have earned local and international acclaim, such as Gesher, The Cameri, and even smaller, experimental groups such as the Tel Aviv Improv Company. Jaffa is the location of the award-winning Nalaga'at Theater, home to the Deaf-blind Acting Ensemble. In 2011 Tel Aviv University awarded Nalaga'at's founder and artistic director, Adinal Tal, an honorary doctorate. Tel Aviv is also the home the Suzanne Dellal Center, the oldest and largest institution in Israel to put on dance performances, promote local dance culture and showcase artists from across the world on its stages. The Center gets over half a million visitors a year and is one of Tel Aviv's most popular tourist attractions. Tel Aviv University is also the only university in Israel with a School of Music, training musicians as well as vocal performers. The school holds over 200 concerts a year on the TAU campus and is invited to tour around the world, performing in Zurich, Madrid and Berlin, among other places. Perhaps not surprisingly, given the city's musical prominence, the Israeli National Opera is also located in Tel Aviv. Tel Aviv was established in 1909, by a group of Jewish families from Jaffa, a port city which has been inhabited for over seven thousand years. Tel Aviv originally began where Jaffa ended, however in 1950 the two cities were united into a single municipal entity. Tel Aviv-Jaffa is now Israel's cultural as well as financial center, a mix of antiquity and innovation, and the center of Israel's high-tech industry and youth culture. Tel Aviv is the center of Israeli industry and commerce. Israel's only stock exchange as well as nearly 40% of the country's finance and banking industry is located in Tel Aviv. High-tech is Israel's number one industry and has been the engine of Israel's rapid economic development over the last decades, even in the face of a global economic crisis. Israel has the largest number of startup firms per capita of any country and the second largest concentration of high-tech companies (after Silicon Valley). 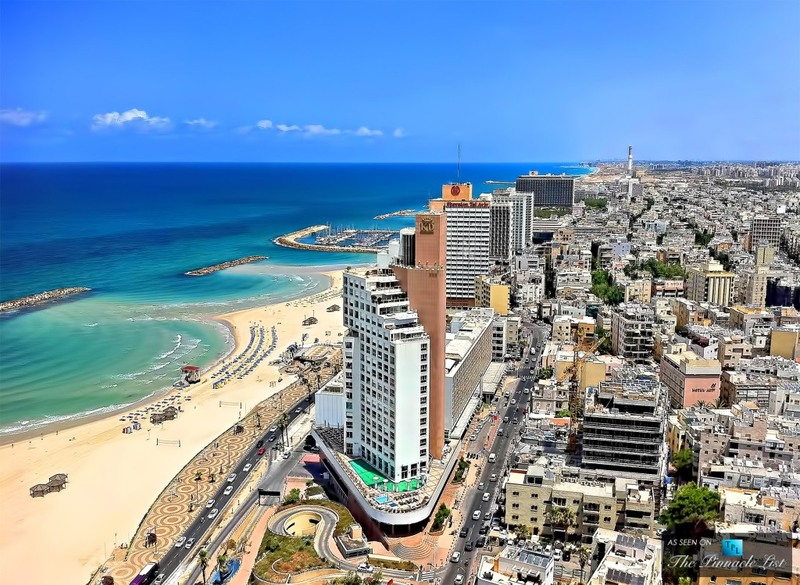 As a city that encourages innovation and creativity, Tel Aviv is the heart Israel's high-tech and information-based industries, home to most of the country's startup companies. In 2010 and 2011 Lonely Planet magazine ranked Tel Aviv third on its list of Top Ten Cities to Visit, calling it "a truly diverse 21st-century Mediterranean hub" and "by far the most international city in Israel." In 2012 MasterCard reported Tel Aviv was the fifth most visited destination in all of Africa and the Middle East. Thanks to its 14-kilometer-long beach strip, in 2010 National Geographic magazine included Tel Aviv on its list of "World's 10 Best Beach Cities," along with Barcelona and Rio de Janiero. Unique in its status as a major center of industry as well as a hub of youth culture, Tel Aviv is located on the Mediterranean coast and enjoys, on average, 318 sunny days a year. The city's public beaches are meticulously maintained and are open to visitors year-round, encouraging everything from laid back sunbathing on the sand to sporting activities such as wind surfing – a sport in which Israel won its first Olympic gold medal in 2004. Tel Aviv has the largest concentration of night clubs and restaurants in Israel, despite being the country's second most populous city. Nightlife thrives in Tel Aviv due to the city's high percentage of residents between the ages of 18 and 34. Some are students at Tel Aviv University, some are young entrepreneurs, many are artists come to experience Israel's most vibrant city. One way or another, Tel Aviv has the highest percentage of young people of any city in Israel, and the city's infrastructure (with green, eco-friendly bikes available for rent across the city), culture and atmosphere reflect this. Tel Aviv University is proud to be part of a city that houses Israel's only stock exchange as well as its most beautiful beaches, all within walking distance of some of the best art galleries, restaurants and nightclubs in the Middle East. Tel Aviv is a global city, rich in diversity and culture. 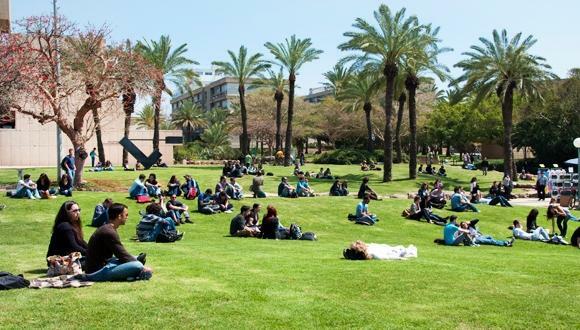 Within its bustling metropolis is Tel Aviv University, home to over 1,000 international students in diverse programs. TAU aims to make its campus a central venue not only for rigorous academic research, but also a wide range of exciting cultural and social events. Music concerts, film screenings, art exhibitions, poetry readings, and many other activities are held on campus. These are open to TAU students, staff, and often the general public. As Thursday is the last day of the Israeli working week, TAU encourages students and staff to kick off their weekend with a host of exciting events: gallery exhibits, film screenings, musical performances, and lectures on a variety of academic fields. Young artists are given the opportunity to showcase their work and the public is invited to share in these activities, which take place from early afternoon until late evening. Check which events are held in English on the "Thursdays on Campus" website. Every two years, The Tel Aviv International Student Film Festival, the largest student film festival in the world, takes place in Tel Aviv, organized from start to finish by TAU students and staff. Renowned actors, directors, and cinematographers deliver lectures and master classes as part of the festival. Hundreds of student films from all over the world are screened for festival goers. TAU encourages students to take part in performances and creative events during their studies. The Department of Theater Arts and the Buchmann-Mehta School of Music put on performances jointly and separately, allowing students to demonstrate their creativity and hard work throughout the year. These achievements are enjoyed by the TAU community and the general public. Every Wednesday, the largest outdoor venue on campus (the lawn in front of the Gilman building) comes alive with the sound of rock music! No need to buy tickets – students and staff can enjoy performances by Israel's leading young artists for free! Lunch al fresco on the grass is particularly recommended. In addition to the rich array of cultural and artistic events regularly on offer at Tel Aviv University, the city of Tel Aviv-Jaffa has much to offer visitors. Tel Aviv is home to hundreds of art galleries and private boutiques, showcasing a unique array of paintings, sculptures, crafts and other works by Israeli artists. The city's art scene encompasses everything from tiny, one-room galleries hidden in narrow, backstreet alleys to large outdoor festivals such as Nachlat Binyamin's Friday Market, to the Tel Aviv Museum of Art, one of the largest museums in Israel. Tel Aviv University is the only university in Israel with a Department of Film and Television, and as such has shaped the development of the film and television industry in Israel. The majority of Israel's successful directors, screenwriters and film critics all began their careers at TAU. In fact, to celebrate young creators and give them a platform to showcase their art, TAU film students organize the International Student Film Festival – the largest student film festival in the world – every two years. With its large cadre of young and motivated filmmakers and as the set location for major Israeli film productions, Tel Aviv has found itself at the center of Israel's film culture and industry and hosts multiple international film festivals a year. 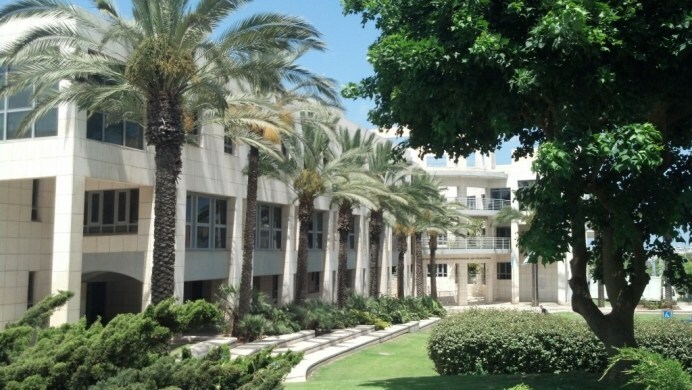 In a milestone for environmentalism at TAU, the university was accredited in 2011 as a “green campus” by the Israeli government, in recognition of its efforts to create a more sustainable institution. The accreditation is awarded to Israeli universities that implement programs in three key areas: academic degrees and courses in environmental studies (given by the Porter School of Environmental Studies), heightened resource efficiency through recycling and reduction of electricity and water use, and community-related projects that strengthen environmental awareness both on campus and off. Among the green innovations at TAU are more energy efficient lighting, the “Nature Campus” educational initiative, stands for the city of Tel Aviv’s new bicycle rental system, and a comprehensive plan for campus bicycle paths. TAU’s support for sustainable projects on campus is further underscored by the Porter School of Environmental Studies’ new EcoBuilding. The EcoBuilding is designed to meet the highest standards of green building, and will demonstrate innovative environmental technologies. 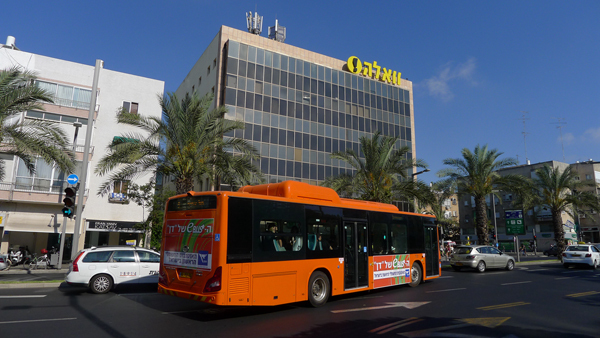 Transportation between the university and central Tel Aviv is easy – buses are frequent and there is a train station behind campus. Many students use bicycles (electric & regular) or ride a "tus tus" (scooter license required). Tel-O-Fun offers hundreds of bicycle rentals at stations throughout Tel Aviv, including Tel Aviv University. Dan and Egged bus lines serve the university and offer discounts to students that are arranged during the first week of the Fall semester. Brand-new on-campus housing is available for international graduate students in the Broshim Dorms, located very close to the Faculty of Law building. Private studio apartments are $800 per month. The Einstein Dorms, across the street from the university's main gate, offers shared rooms while Broshim is private studio apartments. Shared rooms are $600 per month. On-campus housing requests are made through the online confirmation system for accepted students. Students are not guaranteed housing but we will make every effort to accommodate you. Tel Aviv, like most metropolitan cities, has a dynamic real estate market with a constant supply of apartments in every price range. Living in the heart of the city will give you easy access to the beach, cafes, shops and public transportation. Craigslist, Yad2, and Facebook groups are the best way to find available rentals in the area. The Tel Aviv-Yafo Municipality produced a guide on apartment rentals in the area and is available for download. Lonely Planet travel guide ranked Tel Aviv third in a list of "the world's best cities" as well as one of the world's "most vibrant cities for nightlife." National Geographic ranked Tel Aviv as one of the world's top 10 beach cities. The Wall Street Journal and Newsweek magazine rated Tel Aviv as one of the top 10 technologically influential cities in the world. The Huffington Post named Tel Aviv among the 10 best beach cities in the world. The Globe and Mail listed Tel Aviv as one of the world's most creative cities. Conde Nast travel magazine dubbed Tel Aviv as one of the world's best cities for architecture. MasterCard included Tel Aviv among the world's top destinations in 2012. Travelers Digest magazine says Tel Aviv is home to the most beautiful people in the world. Tel Aviv, aka "The White City", is a UNESCO World Heritage Site. Tel Aviv is home to over 5,000 Bauhaus buildings - the largest concentration in the world.